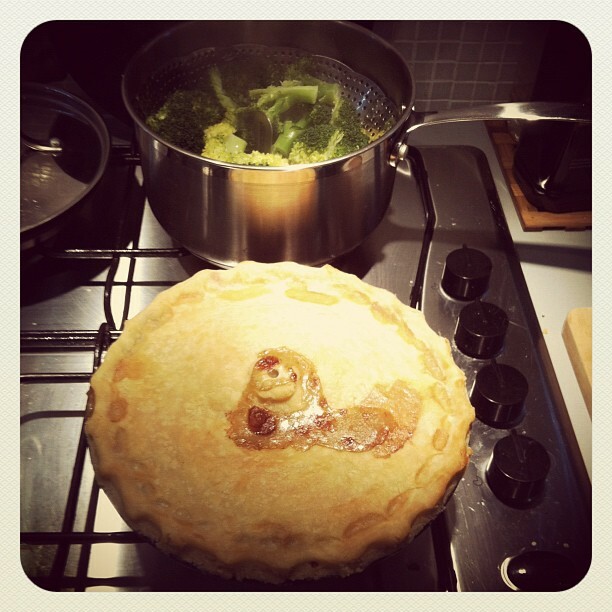 I am pretty damn chuffed with my pie. And with L for suggesting it. It’s what I’m going to call a chicken pot pie… although maybe I should find out what that means first. 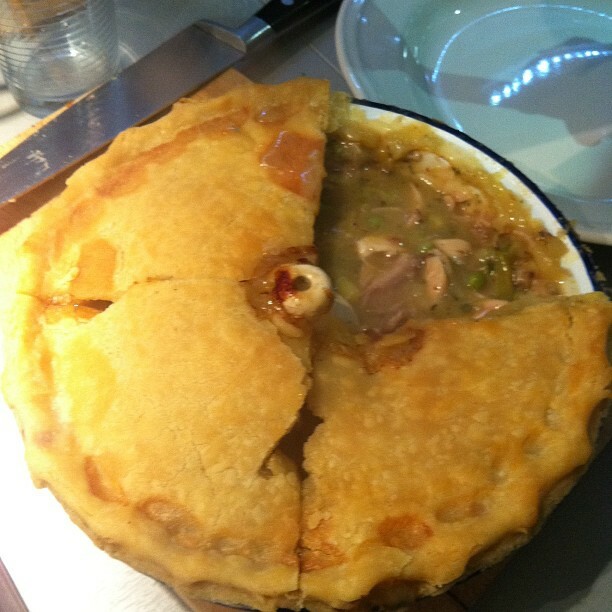 It has a chicken, leek and pea filling (leftover, very frugal), and a gluten-free shortcrust pastry top. Leftover filling came from an attempt at Smitten Kitchen’s recipe for chicken and dumplings – my gluten-free dumplings came out a bit lumpy and chewy. And the gloopiness of the sauce did not impress L (even though I put in 2 tablespoons less flour). I think of floury sauces like that as being particularly American in style, but maybe not actually – I remember my Mum making some tasty chicken casseroles with one of those packet sauces things that were pretty solid. Nom. Anyway – the pie used up the leftover gloop nicely. I made the pastry in the food processor (much quicker), fished out the leftover dumplings, and reheated the sauce before I put it in my lovely enamel pie dish from Utility. I rolled out the pastry between two layers of cling film, which I hadn’t tried before but seems to help A LOT when trying to get big pieces of g-free pastry moved across. And … can you see my little pie support? My Nanna let me take it home when she moved North to be near my Mum. It’s little and white and the glaze is crackled. It belonged to my great-grandmother, and I was so chuffed to get it back in action. Don’t know what they are actually called though? “This human is mine”. He is sorry that we are both mostly recovered from our various bugs and has no warm bodies to lie on during the day. He made the most of the weekend though, which is more than I can say. The cold has prompted me to cast on two more projects, but more on those next time. And what a good looking pie it is too! Thank you! It came out a little tougher than the last one I made, but that might have been more Stork rather than butter (or the vagaries of gluten free baking). Righty-o! I’m quite chuffed, although the crust was a little hard. 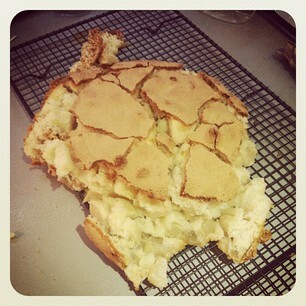 Want to branch out now and make a proper apple pie, with pastry on the bottom too! !